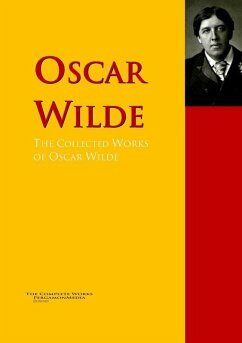 This comprehensive eBook presents the complete works or all the significant works - the Œuvre - of this famous and brilliant writer in one ebook - 5680 pages easy-to-read and easy-to-navigate: • The Picture of Dorian Gray • The Importance of Being Earnest: A Trivial Comedy for Serious People • An Ideal Husband • The Happy Prince, and Other Tales • The Canterville Ghost • De Profundis • A Woman of No Importance • Lady Windermere's Fan • The Happy Prince and Other Tales • The Picture of Dorian Gray • The Ballad of Reading Gaol • The Picture of Dorian Gray • Salomé • Intentions • The Soul of Man under Socialism • Essays and Lectures • Poems, with The Ballad of Reading Gaol • A House of Pomegranates • Selected Prose of Oscar Wilde • Lord Arthur Savile's Crime; The Portrait of Mr. W.H., and Other Stories • Miscellaneous Aphorisms; The Soul of Man • The Importance of Being Earnest • The Picture of Dorian Gray • Reviews • Vera; Or, The Nihilists • The Happy Prince and Other Tales • Selected Poems of • Poèmes (Französisch) • A Critic in Pall Mall: Being Extracts from Reviews and Miscellanies • The Duchess of Padua • Impressions of America • Miscellanies • The Canterville Ghost • Shorter Prose Pieces • Charmides, and Other Poems • De Profundis • For Love of the King • A Florentine Tragedy; La Sainte Courtisane • Children in Prison and Other Cruelties of Prison Life •.etc. Dieser Download kann aus rechtlichen Gründen nur mit Rechnungsadresse in A, B, BG, CY, D, DK, EW, E, FIN, F, GB, GR, HR, H, IRL, I, LT, L, LR, M, NL, PL, P, R, S, SLO, SK ausgeliefert werden.